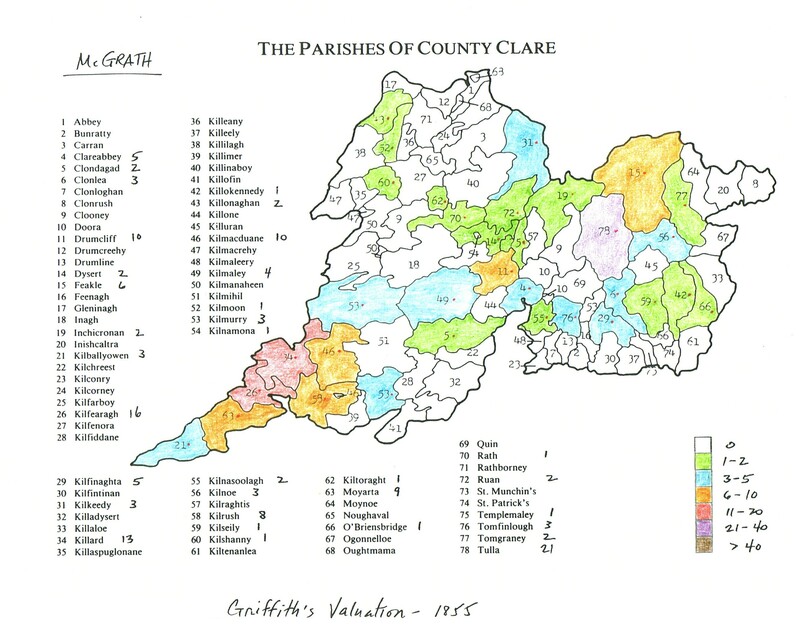 These distribution maps represent the geographical distributions of families with the surname McGrath (Magrath, McCragh, ...) around the time of the Civil Survey of 1654 and almost two hundred years later at the time of the Griffiths Valuation. 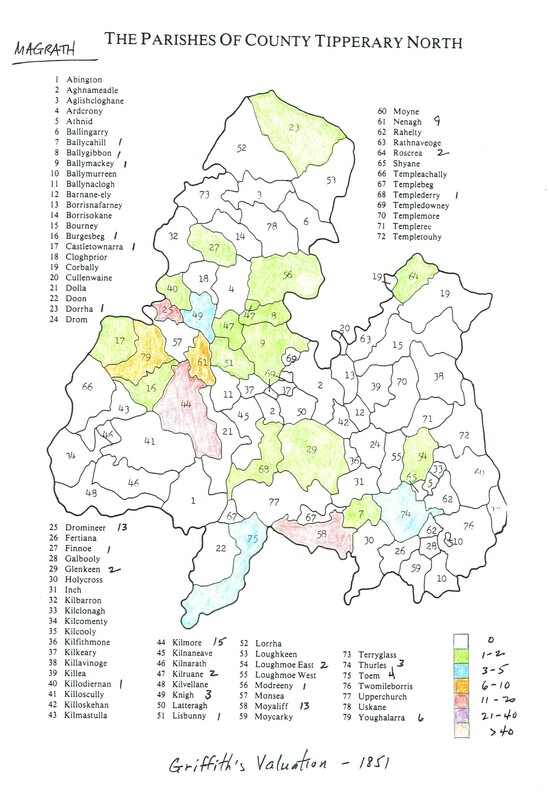 All these sources recorded only the head of the household so it isn't possible to get a true head count as would be expected with a real census. 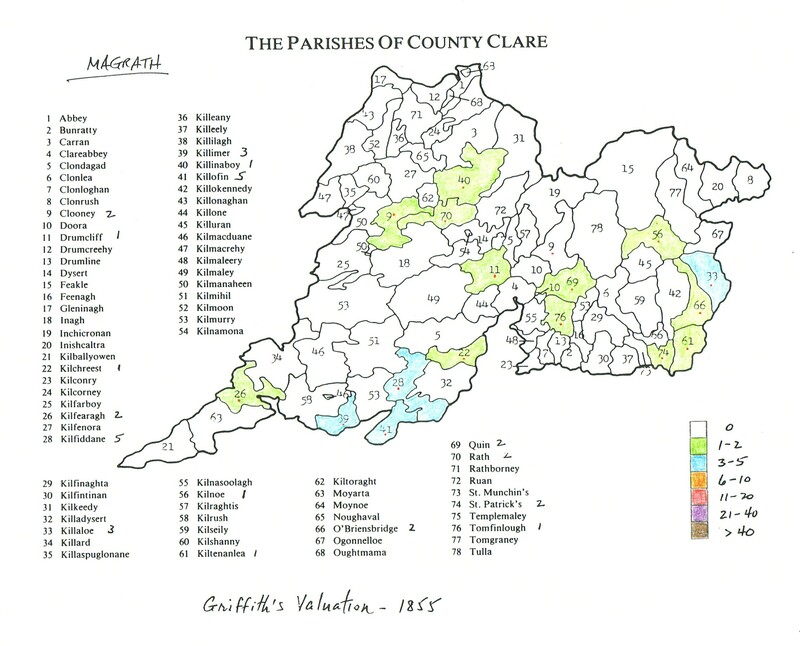 For the earlier period the Co. Clare information came from the Book of Survey and Distribution which recorded the ownership of the land in 1640, prior to the Rebellion of 1641, also who the land was given to during the Cromwellian Transplantations and finally to whom the land was finally given in the 1607 time period after the Williamite War. 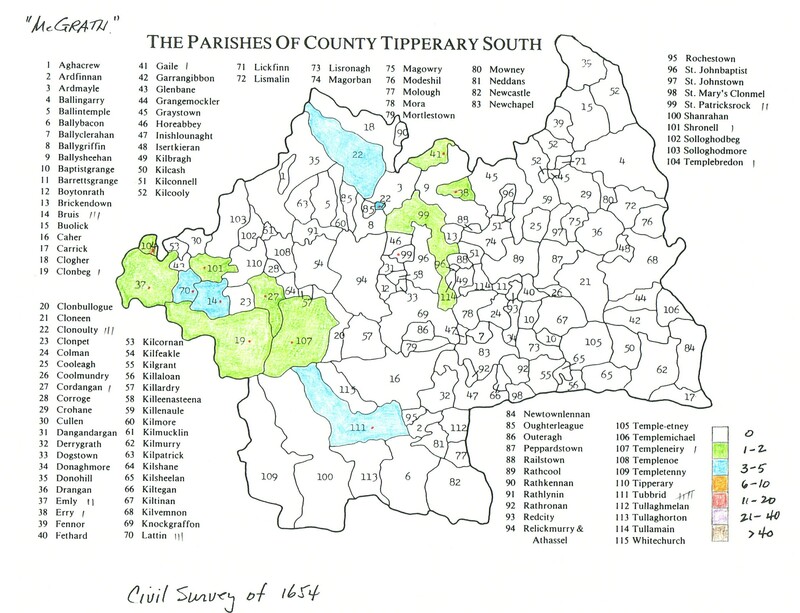 The Co. Tipperary data is from the Civil Survey of 1654 (one of only a handful of counties for which the data still survives). 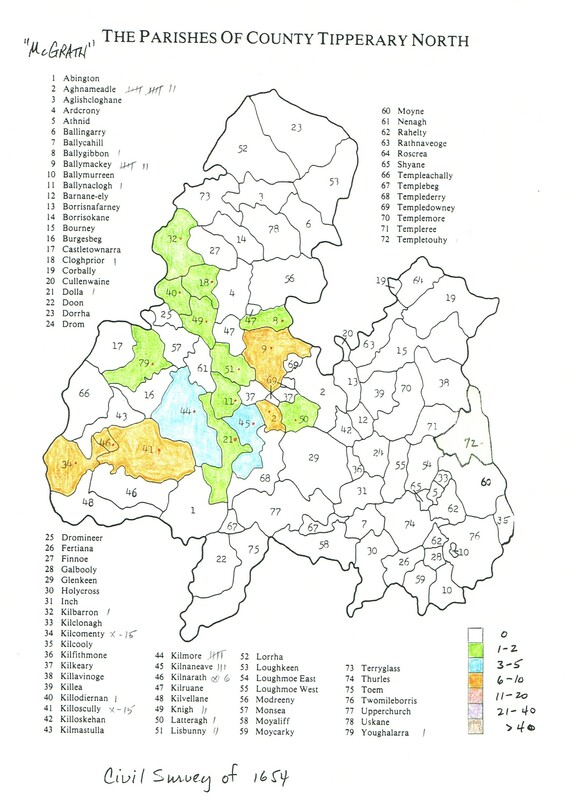 This records the owners of the land in 1640, many of whom lost this land when they were sent to Connaught during the Cromwelliam Transplantations. 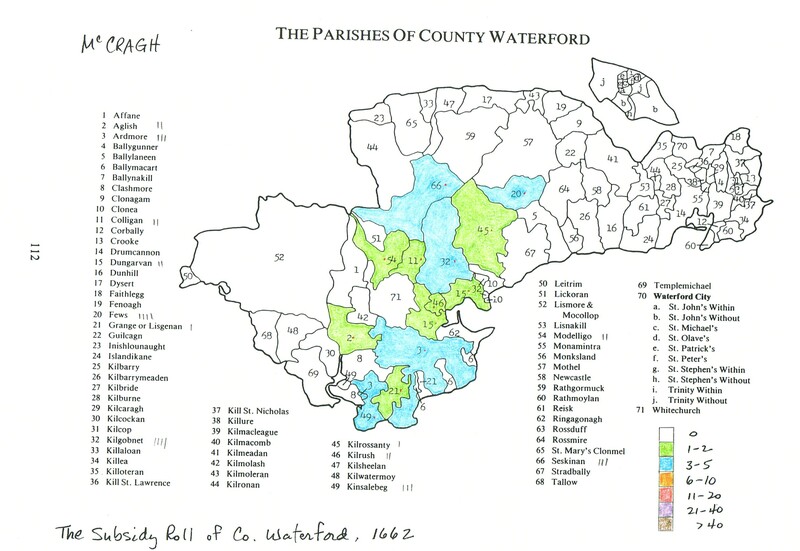 The Co. Waterford data for this earlier period was from The Subsidy Roll of 1662. 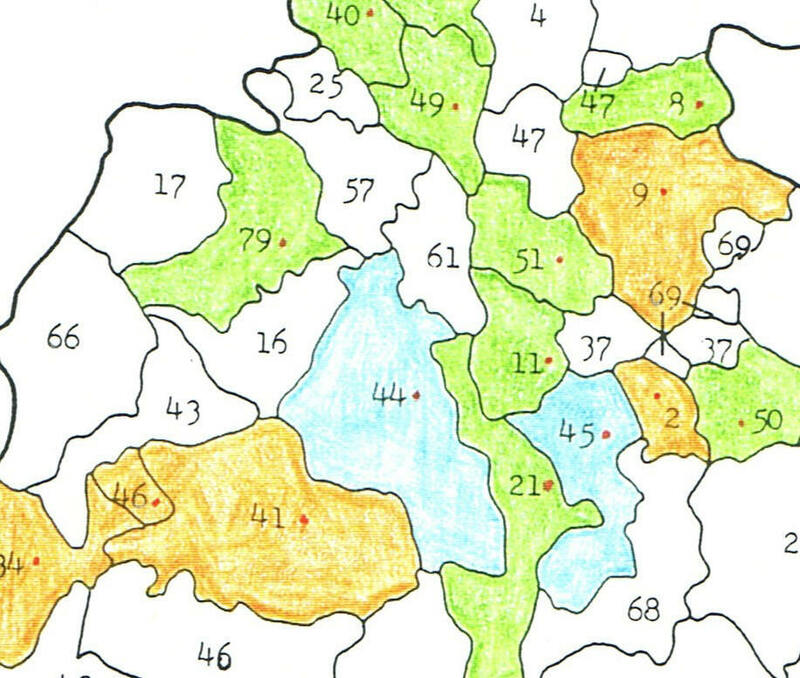 These persons were actually occupying those parcels of land at the time of the collection of the subsidy information. 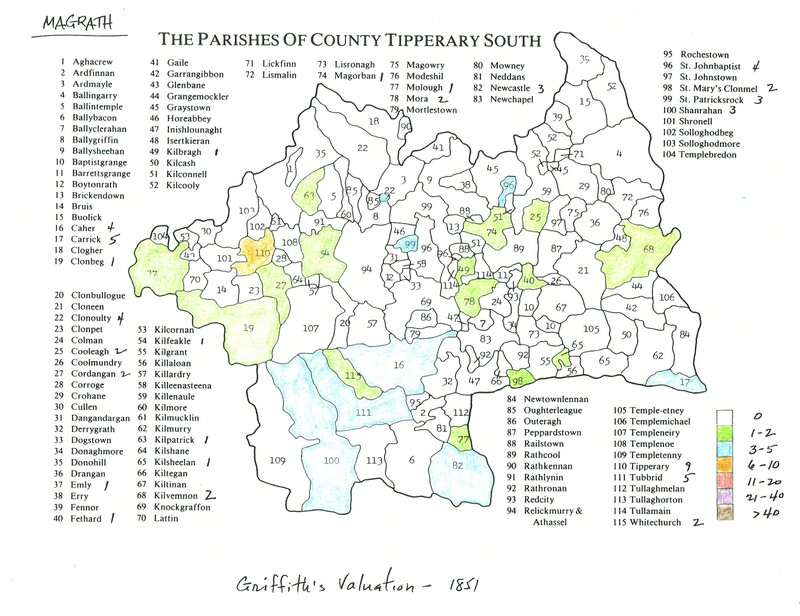 The second time period utilizes the information from the Griffith's Valuation that was published for these counties of interest in the years between 1848 and 1855. 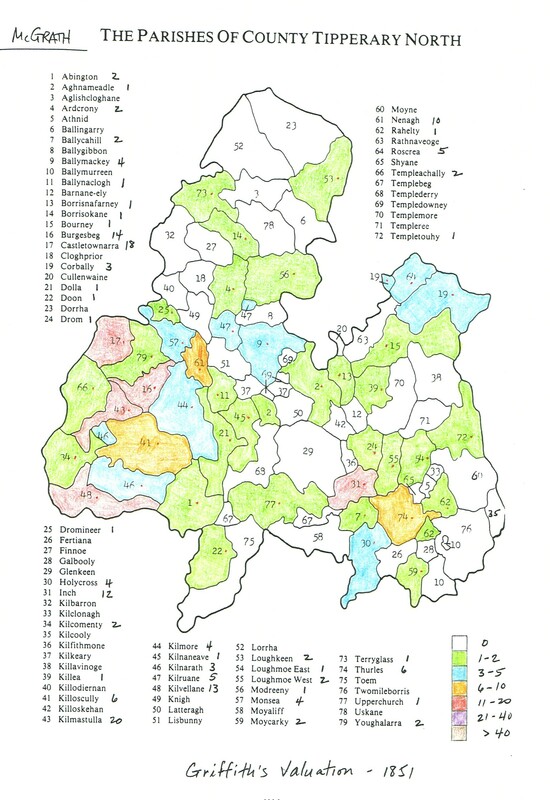 The results for this period were split between two predominate spelling variations of the surname. 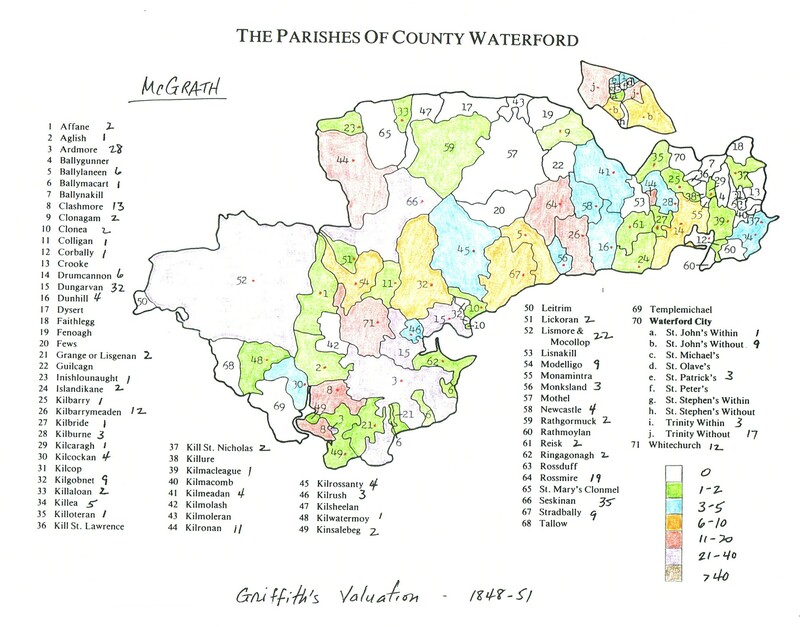 The first group records the McGrath variation while the latter records the Magrath variation. 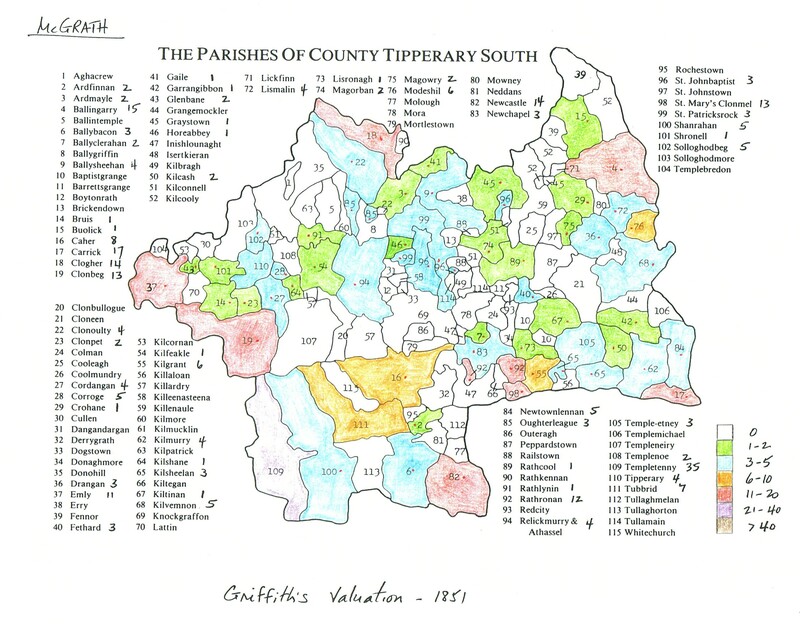 The basic maps are from Brian Mitchell's excellent publication: A New Genealogical Atlas of Ireland. 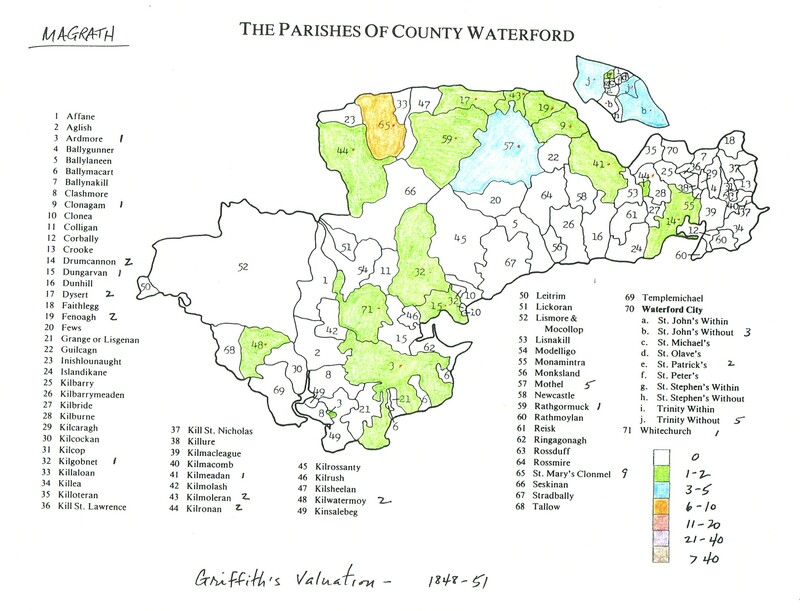 The Griffith's Valuation information came from the CD Database: Index to Griffith's Valuation of Ireland, 1848-1864, from Heritage World & the Genealogical Publishing Co., Inc.